Your Health Matters: Have You Thanked Your Doctor? Have you ever had a doctor who provided you with excellent care and service? How about a doctor who took the extra time to make sure that you were satisfied with your healthcare? Have you ever wished there was a way that you could recognize a doctor who has impacted your life in a positive way? If you answered yes to any of these questions you will be excited to know that March 30th is National Doctor’s Day. According to the National Doctor’s Day Organization, March 30, 1933, marked the first observance of Doctor’s Day. Eudora Brown Almond organized the first Doctor’s Day observance which included mailing greeting cards to doctors as well as placing flowers on the graves of doctors who had passed away. From that day forward, Doctor’s Day was celebrated informally until 1990 when President George H. W. Bush signed a resolution designating March 30 as National Doctor’s Day. Meritus Health will be celebrating Doctor’s Day this year by providing each of our doctors with a Doctor’s Day 2012 mug, chocolates, and a note thanking them for the extremely important work they do every day. In addition, Meritus Health will enroll every doctor in our health system in a raffle. Winners of the raffle will receive tickets to local events. These stars will be prominently displayed in Meritus Medical Center and after Doctor’s Day concludes, the stars will be taken down and delivered to the men and women they honor. I hope that you will join us this month by celebrating the doctors who make a difference in our community. Thank you Cindy and Brett for the wonderful comment! It feels so nice to be appreciated. We truly care about our patients well-being and look forward to providing quality care for people just like you. 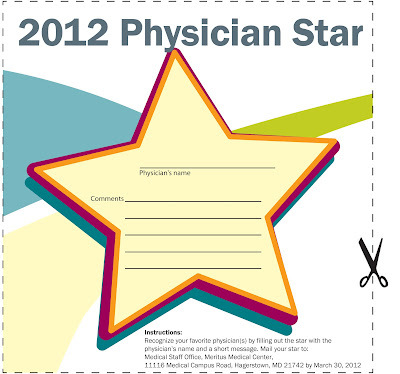 I found out about National Doctors Day too late to print and mail in a star. However, my Mom sufferred a heart attack and was taken to the emergency room on Thursday night. Everyone from the doctor and nurses (Ruben, an ER nurse was the only name I got during that hectic time) to the volunteers at the desk and the security guards were wonderful! She was admitted, and saw Dr. El-Sherif and Dr. Mehboob. Both are highly skilled and reassuring with a gentle and honest rapport with patients and their families. Her ongoing physicians, Dr. Amagashi and Dr. Uzicanin stopped in to check on her right away, providing the important history and connecting the dots to assure all details were considered in her care plan. Even though we have family, they are far away, and I found myself alone during much of this time. I was dealing with things as well as one can during such periods; the professionals at the desk in the waiting room checked on me, and the gentleman cleaning the carpet was kind and caring. It was so very helpful to have everyone at Meritus united by compassion. I aslo want to praise my own doctors - Dr. Qadir, Dr. Kothari, and Dr. Cremins, who I feel always have my best interest at heart, and are consumate pros. I feel they are more like family - very smart and educated family. Please find a way to commend all of these wonderful human beings who have dedicated their lives to helping others who are experiencing times of critical need. Cindy, thank you so much for taking the time to tell us about your great experiences. We truly appreciate it! Your feedback will be passed along to all involved.